Company concern for employees and customers as well as the surroundings of the business is enhanced in the eyes of building occupants and users. If the carpet is allowed to deteriorate to an unacceptable appearance level, that image and show of concern is tarnished. A well-maintained carpet presents a professional and prestigious image. Since carpet is not allowed to deteriorate to an unacceptable level, cleaning procedures are less aggressive and complex and, therefore, less expensive. 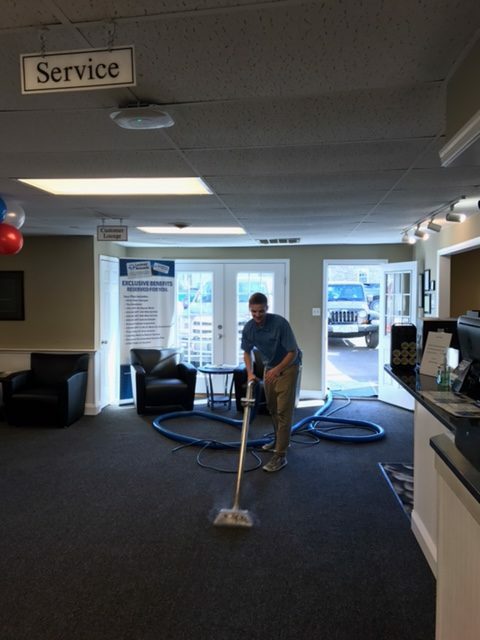 Frequent carpet cleaning also reduces the amount of dust and particulates that find their way into the air resulting in a reduced janitorial cost of cleaning. Since regular cleaning will prolong the useful life of the carpet, the costs of maintenance are amortized over more time when compared to replacement cost. Ownership cost can be calculated by adding the total cost of owning the carpet and dividing by its useful life. Ownership cost can include: downtime of the workplace while the carpet is being replaced, tear-up of old carpet, clean-up of floor, floor prep costs, cost of new carpet, cost of installation, and total cost of maintenance. To see what customers have to say about our commercial carpet cleaning, check out our reviews or call us today!